Green tea is said to work best as a home remedy for acne when used from the inside out—in other words when you drink it. . . . Also, simply placing a warm tea bag on acne lesions helps provide instant soothing effects, helps draw out toxins and promotes faster healing. 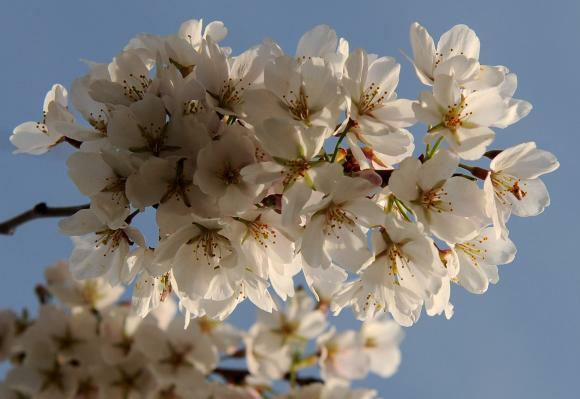 Cherry blossoms in Washington, D.C. Click the above pic for a supermassive, superspectacular panorama. Consider yourself fortunate if you have never even heard of amyloidosis. 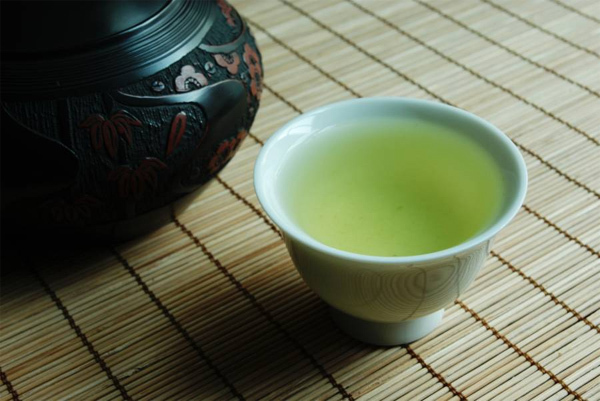 The good news, however, is that green tea is emerging as a possible treatment for the disease. Remember Maru, the cardboard box-obsessed cat? 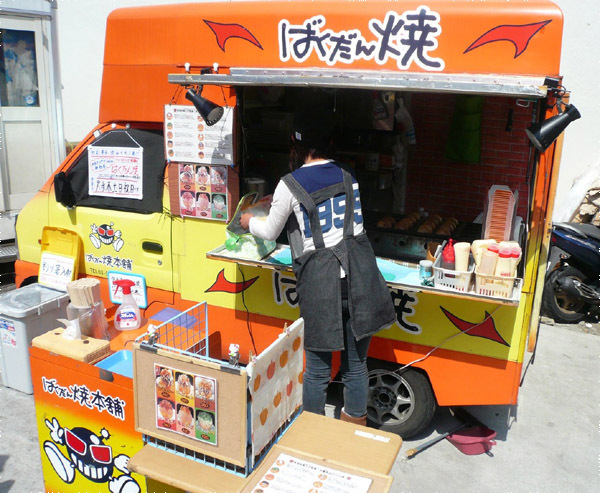 This Is Gonna Be Good—a great blog that, "in the spirit of Tony Bourdain, treats food as adventure"—reviews the fare offered by a takoyaki food van in Akihabara. Mobile food factories like this are a common sight throughout Japan, although perhaps not quite as ubiquitous as vending machines. Attention, all up-and-coming filmmakers: The Tea Council of the USA is having its third annual scholarship competition, Calm-A-Sutra of Tea, which "challenges college students to create a one- to two-minute video about the positive benefits of black, green, white or oolong tea in order to win a $15,000 scholarship." 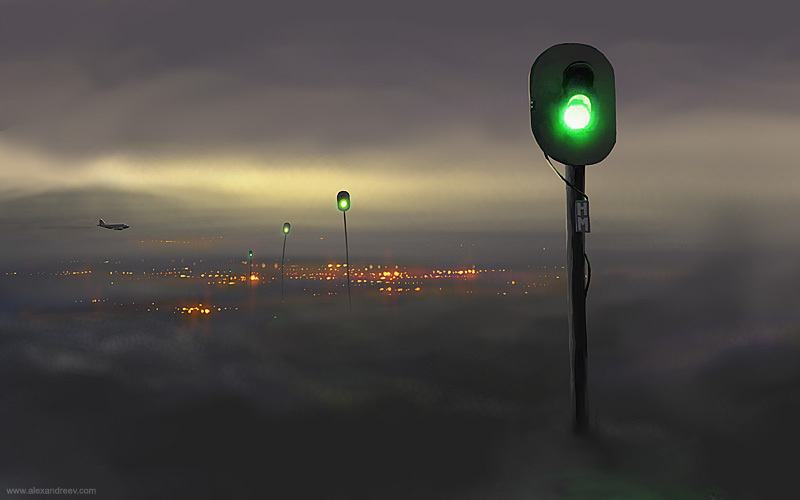 Here is last year's winner, titled "Interrogation." It's actually quite funny and very well done. A stereographic is a photograph taken in such a way that it makes the subject look like its own little planet. Here is a slew of stereographics of Tokyo locales. I promise you that this will make for a very offbeat green tea break. "The river which flows into the sky." This article on using tea in cooking includes a recipe for green tea eggs—which is also recommended in The Low-Carb Cookbook. Please try not to be too intrusive or aggressive when photographing the maiko or geisha on Hanamikoji street. Like superstars, but without the superstar paychecks. Green tea may be a natural appetite suppressant, according to a study published in Clinical Nutrition. A night scene of Yokohama's‘ Minato Mirai district. A study published recently in the Journal of Biomedical Science found that green tea can reduce or prevent acute liver injury. Well I just couldn't post a picture of livers, now could I? Be mellow at work. You’ll reduce your stress and your chances of losing your job. By not worrying about losing your job, you will not only avoid unnecessary stress but also improve your chances of not losing your job. So just sit back, brew up some green tea and relax. But don't forget to get some work done—that will improve your prospects, too. Along the border between Utah and Arizona is a magnificent red-rock formation known as The Wave. Sorry, youngsters. No skateboarding allowed. Remember the Harrison Ford science fiction film "Bladerunner"? Dark Roasted Blend has put together a collection of large-format photos of Tokyo that look like they could have been taken in the futuristic city depicted in the film. More pictures of Tokyo's Rainbow Bridge here. It sure is a brave new world today. In the old days, if you wanted to look up the meaning of a Japanese word, you had plod through a paper dictionary. Now, not only are there online dictionaries like Goo, but there's even the super-fast dictionary Nihongodict.com: Type in an English or Japanese word, and its other-language equivalent appears almost instantaneously. Another cool resource: clickable kanji lookup by radical at Denshi Jisho (Electronic Dictionary). This has nothing to do with learning Japanese. 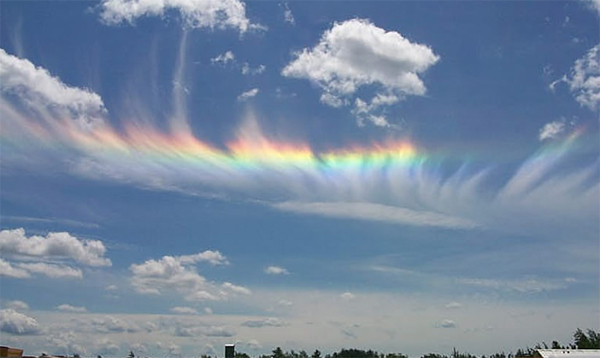 Instead, it's just a mellow photograph of a circumhorizon arc, also known as a summertime halo. 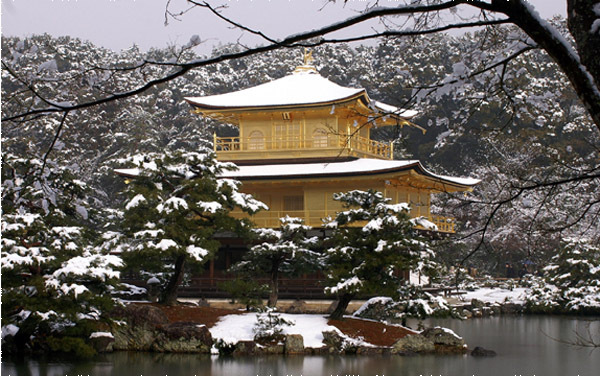 A Japanese blogger has posted some beautiful photographs of the Golden Pavilion Temple (Kinkakuji) in the wintertime. Of these pictures, this one is my favorite. The titular structure in Yukio Mishima's Temple of the Golden Pavilion. In traditional Chinese medicine, the heart is considered the emperor of all the body's organs. And so green tea, with all of its cardio-protective effects, can be considered the Emperor's guard—a most sacred duty indeed. 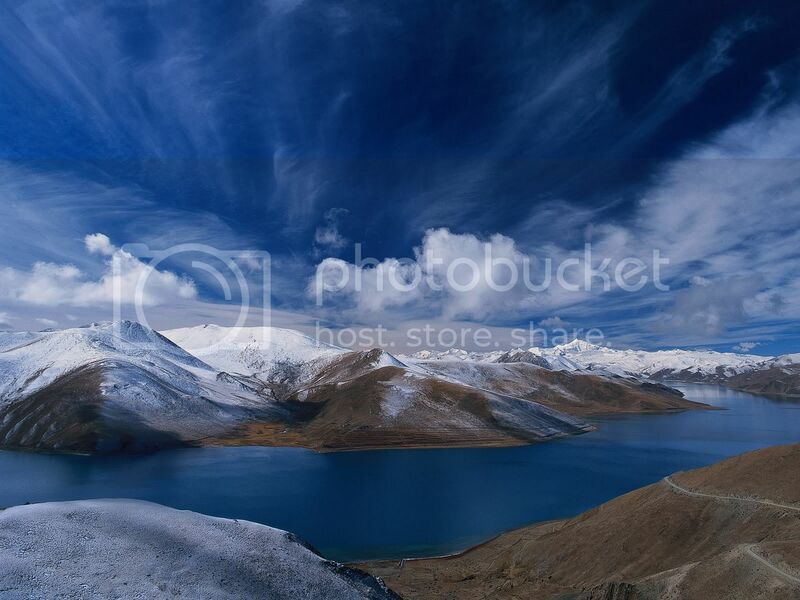 I would feel like an emperor gazing down at this magnificent sight somewhere in the Sino-Tibetan mountains. Lewis at the tea blog Multiple Infusions has kindly reviewed our Blissful Buds Green Tea. Our Blissful Buds Green Tea as brewed by Lewis. 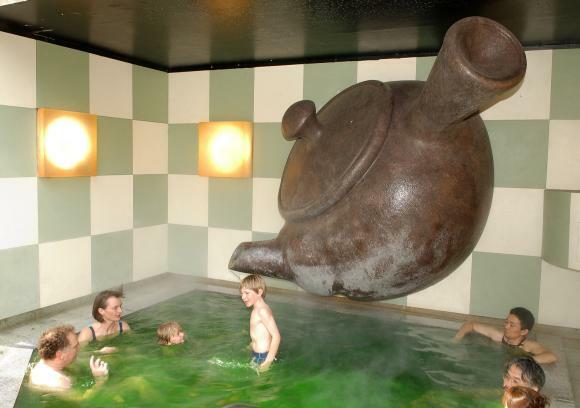 UPI has two really cool slideshow—some of Japan's most offbeat hot springs (onsen), and the cherry blossoms blooming in Washington, D.C.. 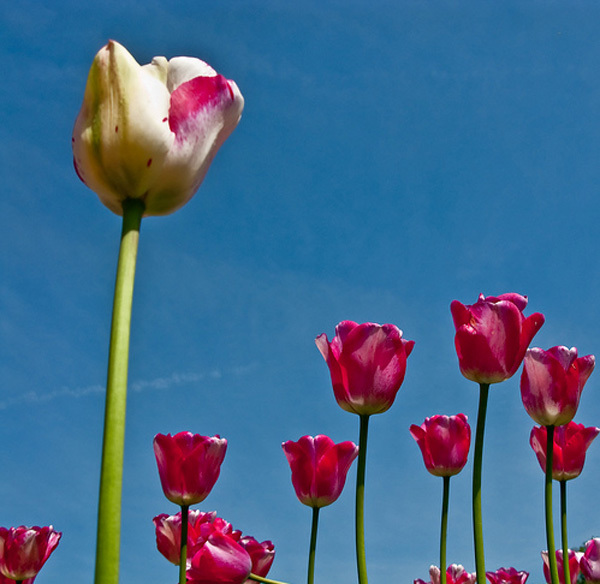 The more complicated our world gets, the more we seek out respite in pockets of simplicity. Thus even "captains of the Internet" and former quad-cappuccino-quaffing techie types are discovering the soul-soothing tranquility of tea. Business guru Tim Ferriss prepares a pot of mellow. A study published recently in the Journal of Food Science found that brewed green tea in storage lost a "highly significant" 32% of its catechins after 6 months. When you consider how long it takes for a batch of bottled tea to be trucked from the factory to the warehouse to the supermarket to your home, it is easy to see that that by the time you actually twist the top off your bottled green tea, it will most certainly not contain the amounts of EGCG and other catechins indicated on the label. This is yet another reason to brew your own tea. If you want, you can read the entire article (PDF). So remember—finish your cup of green tea before you head off for Greece. The women folk here at Mellow Monk recently had the opportunity to try a pair of yoga pants from Yoga Hyde. This particular pair, which you can see modeled in the photo below, are Hyde's Engineered Seam Yoga Pants. All who tried the pants were absolutely delighted with them. The jersey fabric—a 95% cotton, 5% spandex blend—is substantial and supportive yet soft and unrestricting, as you can see from the high-kick executed by the Monkette in the photo. As one of the reviewers said, these pants are not only comfortable enough to wear all day, but she wishes she could wear them to the office, too. After all, you never know when you will need to execute a swift, accurate high-kick. 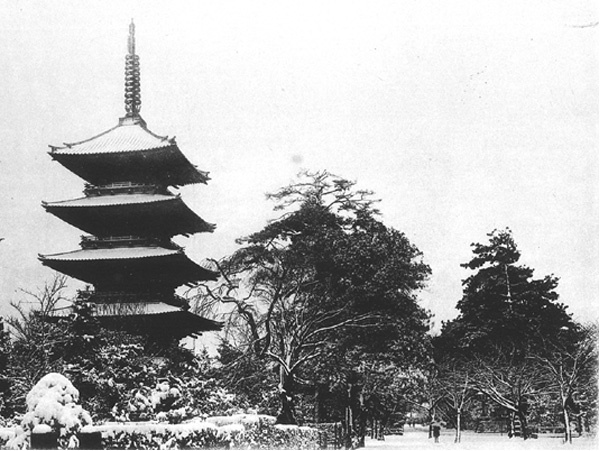 In Tokyo's Yanaka district, on the grounds of the Yanaka Cemetery, once stood a pagoda. 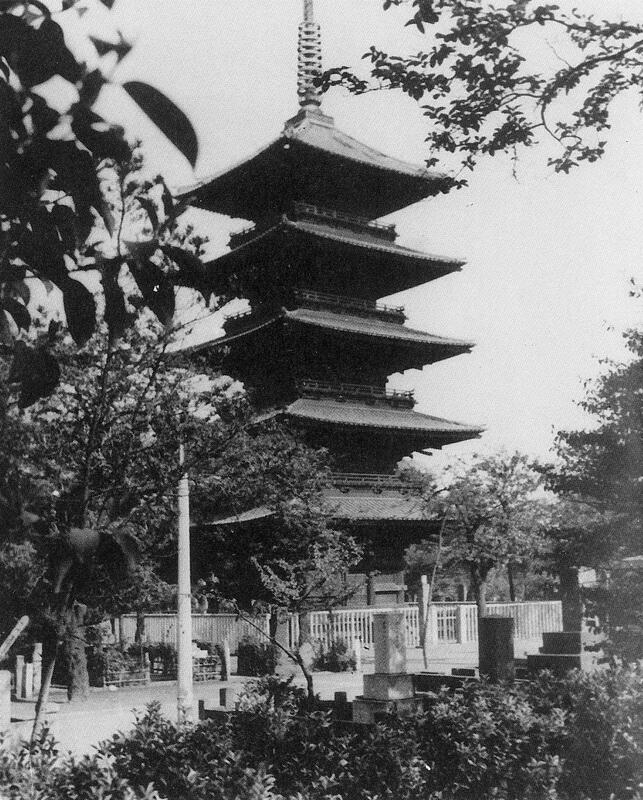 Originally built in 1664, the Yanaka Pagoda burned down in 1771 but was rebuilt in 1791. After standing for over 160 years, however, the pagoda burned down once again, this time in a sad, bizarre case of double-suicide arson. Today, only the foundation remains. The late pagoda in wintertime. 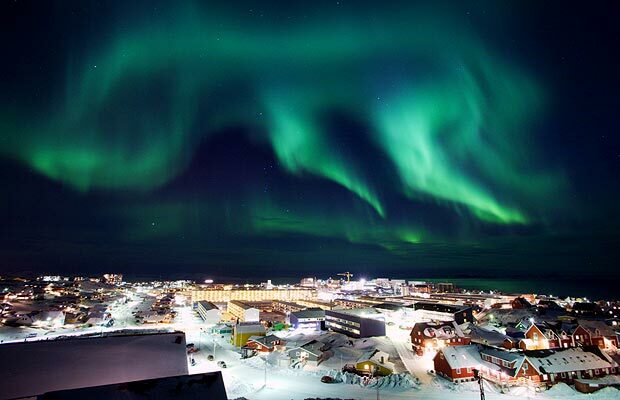 Another nice image can be found here.